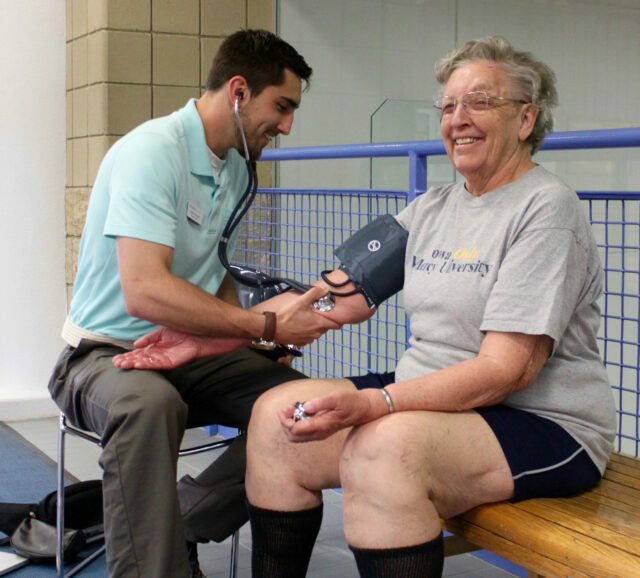 Clarke University’s Doctor of Physical Therapy (DPT) students host a clinical practicum in the Robert and Ruth Kehl Center on the campus of Clarke University every Tuesday and Thursday from 9:30 to 11 a.m. They serve patients from from the tri-state area who don’t have health insurance or are underinsured. This service is free and the positive results are two-fold. Students get hands-on experience with actual patients in real-life situations, and patients receive one-on-one consistent care throughout the year. The students also travel to places such as Mount Carmel, Mt. St. Francis, the YMCA of Dubuque, Assisi Village, and Oak Park Place to provide patient care. The practicum on Clarke’s campus began in 2001. The idea was to provide free, accessible care for those in need, while providing DPT students the ability to evaluate a patient, decide on a plan of action, and implement the care. Bill O’Dell, Chair and Professor of Physical Therapy, said, “The clinical practicum has grown signifantly over the years. It started with students seeing a small number of patients in the Kehl Center. We now reach out into the community and provide up to 90 patient visits per week for indivduals who otherwise would not receive appropriate care.” He said that faculty have conducted research on the value of this type of experience and published ‘Utilization of an Integrated Clinical Experience in a Physical Therapist Education Program’ in the Journal of Physical Therapy Eduction. He continued to say that students consistently state the practicum is a strength of the program. The patients who come to the practicum praised the program, saying it has not only helped them physically, but also they like the opportunity to socialize with the other patients and with the DPT students.